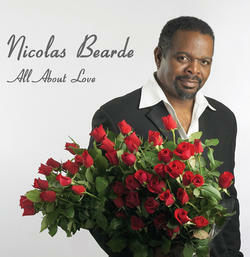 On this CD, Nicolas Bearde gives a nod to some of his favorite contemporary composers and sweetens the set with 7 original compositions. “All About Love” celebrates the joys and heartbreak of love and romance. With vocal stylings influenced by masters such as Marvin Gaye, Lou Rawls and Johnny Mathis, Nicolas taps into the music that has influenced him throughout his life, including the music of Motown, Stax and Blue Note.